16 - Fitchburg Hometown Pharmacy Collecting Meds/Sharps! Since the last newsletter, the Prairie UU Society venue for Make Music Madison has acquired 3 new artists/groups to perform at the June 21 music festival. They were added at the beginning of the show which now will start at 11:15 a.m. and run until 8:15 p.m. The location is 2010 Whenona Drive at the corner of Crawford Drive. The new artists are Total Challenge Drumline, Three Voices of Praise, and Minister Darryl on the Sax. The Total Challenge Drumline group is 5 young men who “talk” through their drums. They are scheduled first because the sound of drums will undoubtedly reverberate throughout the neighborhood and notify everyone that the day of music has started. The other two groups are self-explanatory. Rain or shine, these acts will all perform. In case of rain, the whole she-bang can move indoors. Look over the schedule of musicians. We’re told that our program has the longest list of performers in the city. You can check that on the insert from last week’s Isthmus: We are the first item on page 10. Come for the entire day or just for the groups you think you’d most enjoy. Some refreshments will be available on the grounds for reasonable prices. Expect fresh grilled jerked chicken thanks to our Vice President Deacon Tony Williams, sweet bake sale items thanks to Council member Denise Williams, popcorn thanks to Council member Heidi Figueroa, soda, and bottled water. Or bring your own picnic. Although some folding chairs will be provided, it’s probably best to bring your own more comfortable lawn chair. If you have insect repellent, spray or slather it on, because there’s been a big hatch of mosquitoes lately. We’ll try to have more available on the site. 11:15-11:45 - Total Challenge Drumline - 5 young men talk through their drums. 11:45-12:00 - Three Voices of Praise - 3 young ladies sing songs of praise. 12:00-12:15 - Minister Darryl on the Sax - Minister Darryl plays gospel songs on the saxophone. 3:30-3:45 - Mad Town Spoken Word - Young men Jesse Cole & Dimitrius Olver perform original poetry. 4:30-5:00 - Dan Proud performs with guitar and harmonica. Paula Pachciarz, Carl Wacker, Patty Stockdale, & Mary Mullen will join him later in his act. *5:00-5:30 - Guitars for Vets - Veterans who earned guitars by learning to play lead a singalong. Very popular last year. *6:00-6:45 - Dark of the Moon Contra-Band - Women’s folk band - Mary Mullen, Bonnie Gruber, Carol Steinhart, Rebecca Forbes, and Christine Henze - play polkas, reels, jigs, waltzes and more. *7:15-8:15 - Grandpa Squeezit - Mike Briggs plays accordion. Parents/Guardians will need to sign a permission form/waiver when they drop off kids (or may send form with kids). Parents/Guardians may attend with children and can also help with mosaics. Children younger than 5 should be accompanied by an adult. Kids enrolled in the Boys & Girls Club Youth Program will also work on the mosaics. This will happen every Tuesday and Thursday morning from June 24-July 24. Wildlife abounds in the Dunn’s Marsh neighborhood, some of it endangered by the “civilization” around it. Wouldn’t you be thrilled to see what various people have spotted recently? All spring including the present - Live rabbits pose like lawn ornaments in almost every yard. They have no fear. Early in the spring, 4 rabbits were running and playing leapfrog over each other in the space where my backyard and my neighbor’s meet. More recently, on the east edge of Marlborough Park I caught sight of 2 bunnies jumping at each other, sitting motionless, and then jumping up again. My cat regularly catches young rabbits, and we allow her to feast on them, because those dratted rabbits ate our tulips and prevented them from blooming, and we’ve had to cage the plants they like. 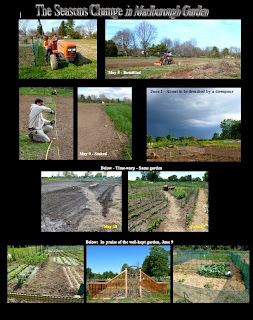 May 9 and continuing - In Marlborough Garden, small softly-striped grayish female cowbirds pecked around the garden and came to within about 3 feet of volunteers who were staking the plots and in later days while gardeners worked in their plots. They seemed curious and almost tame but would run away if approached more closely. June 2 - A huge snapping turtle plodded slowly across Seminole Highway near Dawley Park. Traffic was stopped in both directions and getting impatient. Two of us got out of our car and enticed it across to the east side of the park by alternately touching its shell and extending a hand in the direction we wanted it to go. One motorist suggested picking it up by the sides of the shell and said it couldn’t reach around to bite, but its flailing claw-covered feet seemed like a threat, not to speak of its massive size. Another motorist said this reptile was headed for turtle heaven. Once we got it into the grass and most traffic continued on its way, man in a pick-up truck partked, got out, and said he wanted to take the snapper to his pond near Belleville. He wore heavy gloves and picked it up by the tail and put it in his truck. This turtle’s shell was at least a foot long. Perhaps it weighed 15-20 pounds. Two front teeth hung out its mouth like those of a alligator. June 3 - As the UW Water Resources students worked to launch their boat into Dunn’s Marsh, we all saw a deer swimming across Dunn’s Marsh toward the Cannonball Trail. It jumped out of the water onto the trail and bounded west toward the high intersection with Southwest/Badger State Trail. June 9 - As Dane County Park Planner Chris James, Rachel Potter, and I walked along the paved bike path along Seminole Highway to the place we could enter the County’s land that will become a mountain bike path, Rachel spotted movement in a tree. A mother racoon and her half-grown young were scaling the tree in a moving scrum. The mother parked herself high up in a crotch and peered at us. June 14 - As my cat roamed along fence in my neighbor’s yard next to my garden and near a blue spruce tree, 3 chickadees perched here and there on the fence and flitted around, scolding the cat. Right now - Let’s not talk about all those baby mosquitoes that just hatched from wigglers. Looks like it is going to be a bumper year for them. Time to get out the mosquito repellant. Hi, I’m Thea Bach, your Danbury Street neighbor, Secretary on the Dunn’s Marsh Council, and chair of the Social Commiittee. I got involved in the Dunn’s Marsh Neighborhood Association because I’m passionate about people, animals, and causes that are worthy. It’s a great way to meet wonderful folk - like you! It is also a fun hobby. Currently I am employed as an L.P.N. In my spare time: homemaker, church activities, working/hiking, cycling, scrapbooking, visiting friends and family, sewing, and more. I look forward to continuing to serve the neighborhood. Editor’s note: Thea has been on the Dunn’s Marsh Neighborhood Council since October 2011. She is the person most responsible for getting the two Little Free Libraries in the neighborhood (on Danbury/Lumley, and Whenona/Crawford). 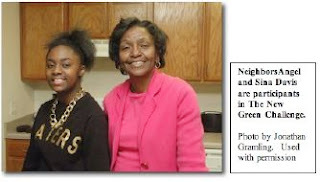 Her inquiries to the City of Madison about applying for a grant turned up the information that our grant for a neighborhood sign was still good. The sign is now also a reality, since the summer of 2012. On June 3, a bright, breezy day, five University of Wisconsin Water Resources students launched their raft on Dunn’s Marsh to set a measuring instrument in the marsh waters. I just happened to see them parked along the marsh property with their blow-up raft and stopped by to ask them a few questions and cop a few photos. Dissolved oxygen is a stand-in for water quality. More dissolved oxygen allows for more species of aquatic life and higher quality aquatic life. The less dissolved oxygen, the lower the quality of the water for aquatic life, and the fewer kinds of aquatic life that can live there. The students at the launching were Anna Brown who has attended several DMNA meetings, Andrew Manghan, Corin Franklin, Aaron Lamb, and Christian Dewey. The students, with the help of the DMNA, will be taking surveys door-to-door in the neighborhood in July. Look for them. University students have contributed to the Dunn’s Marsh neighborhood many times over the years since the DMNA was established in 1973. This year the City of Fitchburg is harnessing the power of 3 student interns to work on what’s called “community based social marketing” for the benefit of Dunn’s Marsh watershed. These students responded to a listing for students who want to volunteer this summer in the community. Why do they do it? Fitchburg’s Sustainability Specialist Kristofer Canto suggested that these students chose the Fitchburg opportunity because they are interested in the environment. Participating will also put a bright spot on their resumes. What will they do? They’ll be doing outreach and education on water conservation and energy conservation in the Dunn’s Marsh watershed. The ultimate goal is a “Community Based Social Marketing Plan” that will encourage residents to actively and consciously lower the amount of water runoff from properties in the watershed. These interns will base their work on the survey planned by the Water Resources graduate students who are already monitoring water quality in Dunn’s Marsh. That survey will be taken door to door in the watershed in July. When will it happen? The students will meet once a week all summer. Implementation of the plan is anticipated for this fall or the spring of 2015. How can we particpate? Be open to the suggestions that come out of this joint Fitchburg/UW student effort . The day dawned sunny and crisp, a great day for the May 17 neighborhood garage sales. Ten families took advantage of the work of the DMNA Social Committee. The committee had proposed the event, distributed registration flyers around the neighborhood, advertised in the newspaper and on Craigslist, and put up signs. At the June Council meeting Social Committee Chair Thea Bach reported that the garage sales were a lot of work but that they were successful because it was a nice day, and people enjoyed themselves. Neighbor Yannette Cole added that the sale helped her get rid of things she’d wanted gone from her basement for a long time. The Social Committee will be meeting on Wednesday, June 18, to talk over how to have an even more successful event next year. Anyone is welcome to join this group. Give Thea a call for details if you want to attend: 274-7730 or 239-9810. 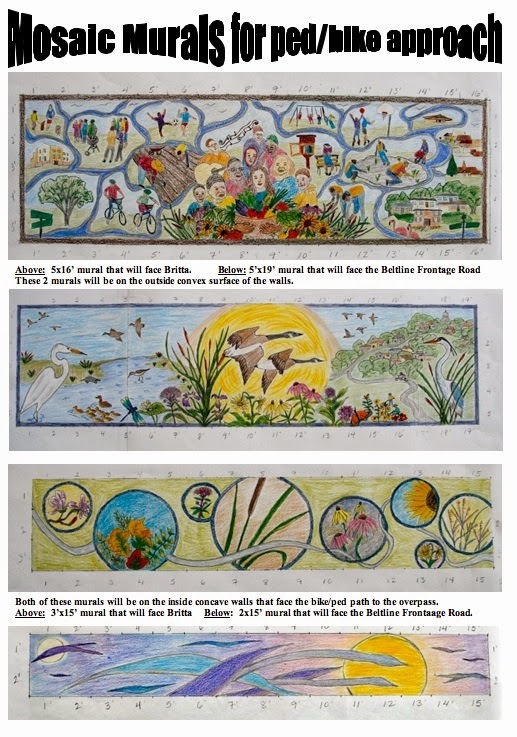 In a lively meeting at Culver’s on Thursday, June 5, mosaic artist Marcia Yapp showed her work toward the 4 large murals that will be put on the path up to the Beltline bike/ped overpass near Whenona/Britta Parkway/Axel Avenue. The last newsletter displayed some graphics of these murals, but the reproductions were so small that they were only an impression. On paper we could see many more details. The committee of 4 people who met with Marcia also learned that she actually had alternative drawings for the murals. In a free-flowing discussion, we learned that we all favored Marcia’s alternative #3 for the mural that will face Britta/Axel. In Marcia’s words, it’s a view that emphasizes the abundance of the Dunn’s Marsh neighborhood. That abundance is shown in the cluster of multicultural faces front and center of the mural and the activities of many different people on both sides: dog walkers, bicyclists, gardeners, people picking up litter, others barbecueing, somebody reading next to a Little Free Library, and kids swinging, playing soccer and shooting hoops. All are joined by many paths that also serve to set off each activity in a sort of collage. In addition, homes, apartments, and the two community gathering places are shown - the two churches in the western part of our neighborhood. Have you seen those pink flamingoes in several places in the neighborhood? They are there too. She also showed her colored drawings for the mural that will face out toward the Beltline Frontage Road. That mural features marsh images including geese flying across the sun. A view of the land portion of the neighborhood has images of the bike trails and homes as well as the capitol building on the far horizon. The inside of the curved walls will have murals too. One mural she calls “Flight.” It has rather abstracted drawings of geese flying. The other is 8 circles of various sizes that contain nature images. The four committee members who were available for this meeting were Denise and Tony Williams whose apartment will have a full view of the murals facing Britta Parkway, Patty Stockdale, and Mary Mullen. Everyone left the meeting excited with the prospect seeing final drawings. The designs will be completed in the next few months. Then, probably over the winter, all residents of the neighborhood will be invited to help construct the mosaic murals at neighborhood workshops. In an open letter to bicyclists and advocates, Fitchburg avid biker and alder Steve Arnold, asks for support to complete access to the PD bike bridge that will connect several long-distance bike trails. His lengthy letter follows. Your advocacy is needed! I apologize for this long message, but the issues are complex, and I don't want to gloss over them. 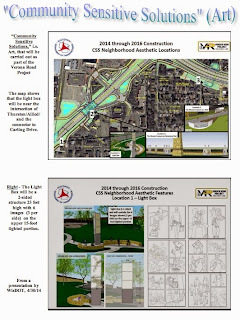 You are probably aware that a new bridge, under construction over McKee Rd (CTH PD) just east of Verona Rd, will carry the Military Ridge State Trail north to the "bicycle interchange", connecting to the Southwest Path, Cannonball Path, Capital City State Trail, and Badger State Trail. The bridge is being built by WisDOT as part of the Verona Road project. Paving of the Cannonball Path and realignment of the Military Ridge State Trail were delayed to coordinate with the completion of the bridge this year. south access path would be built later, in conjunction with a future DOT project in some future year. Having no south access path could lead to bridge users crossing the six lanes of McKee Rd under the bridge without the help of traffic controls, sidewalk bicycling along McKee Rd, or wrong-way bicycling in the McKee Rd. bike lanes. Since the next stage of Verona Rd construction around McKee Rd begins in 2017, this dangerous situation is likely to persist for three years. Absent in the discussions of this issue have been bridge users, particularly bicyclists. I have argued, without much success, that delaying the access path or redesigning it to optimize parking for General Beverage, to the detriment of bridge users, is bad public policy. Instead the original design should be used, and WisDOT should work with General Beverage to modify the interchange design so as to not need so much land from the company. Please consider coming to the Common Council meeting, at City Hall, 5520 Lacy Rd, to support the bicyclists and pedestrians who will use the bridge. You can speak or merely register in support. Since the draft resolution has both east and west side alignments, your oral or written comments must specify that you support a western access path and completion this year. If you have questions about the bridge options or the mechanics of testifying before Fitchburg's Common Council, do not hesitate to call or write to me. Give yourself a nice treat if you are biking out Seminole Highway. 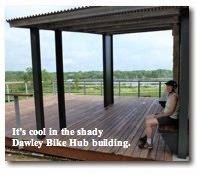 Stop at the new bike hub building at Dawley Park. Dawley Park is just past the crossings of the Cannonbal Trail and the Capital City Trail and between the two curves on Seminole Highway. Recent visits to the bike hub revealed amenities any bicyclist might need or want. Hot, thirsty, and tired? Sit in the shade of the roof on built in benches. Get a cold drink from the water fountain, or push the button to fill your water bottle. Ready for a change from pedaling or sitting? Go out on the deck and lean against the rail while enjoying the breeze and a panoramic view of Dunn’s Marsh. Your bike tires have gone soft? There’s a handy air pump. Got a mechanical problem? Just put your bike up on the bike stand and use the many tools attached to the stand. Need a restroom stop? Well, the doors were still locked, but maybe soon they will be open. The short of it is that we explored a mountain bike park and came away with fewer fears than we began with. The long story follows. The day was sunny and warm - well, hot - but a perfect day for DMNA Council members Rachel Potter and Mary Mullen to explore the Quarry Ridge mountain bike park in Fitchburg. We were checking out this nearby park, accessible from the Military Ridge Trail or Fitcherona Road, because Dane County has been entertaining the notion of developing a similar mountain bike park on County land just south of Dunn’s Marsh. The two of us started out in a skeptical mood. Mountain bikes on hills in the woods - wouldn’t that be a recipe for erosion, a possible threat to wildlife, and a disturbance for nearby homeowners? After touring the Quarry Ridge facility and then meeting with Dane County Parks staffer Chris James at the planned Seminole Bike Park adjacent to Dawley Park, our fears were muted if not entirely evaporated. The experience on foot at Quarry Ridge was much like walking rustic trails in a state park. The single track one-way bike trails are about a foot wide with brush cleared back somewhat so it isn’t touching walkers or bikers. Birds were much in evidence, scratching in the leaves, flitting in the brush, and singing. The trails wound back and forth across the slopes mostly under the blessed shade of trees. Occasionally we spied a switchback through the undergrowth. In a couple of places a technical boardwalk type of facility with curves and bumps had been built in a wide spot in the trail. In those places the single track trail sat well away so that a biker or walker could continue without conflict. We also met 4 young men on mountain bikes. Were they noisy or obnoxious? Not at all. They were just as quiet as hikers are. One of them was a member of CORP - Capital Off-Road Pathfinders - the mountain-biking group that helped construct the trails in Quarry Ridge. We learned that all 4 work at Pacific Cycles, just past Home Depot and next to the Southwest Bike Path where it crosses the Beltline. They said they ride out from work every day to ride in Quarry Ridge Park. We were duly impressed. Rachel asked many questions about mountain biking and the CORP group. What happens when the trails are wet? Do they still ride then? Their answer: when it’s so wet that their wheels sink into the dirt more than the depth of their tire treads, they simply call the ride off. After an hour of walking, we got back in the car and headed back to the neighborhood, specifically to the new bike hub on Seminole Highway in Dawley Park. The bike hub is that stone building between the two curves of Seminole after you pass Dunn’s Marsh. We were very happy that the fountain was turned on and we could take advanatage of the fresh, cold water. There’s even a button to push to fill a water bottle. We met Chris James of the Dane County Parks Department at the bike hub building. With him we walked south along the asphalt path parallel to Seminole Highway to the point where the county land begins. It was on this short walk that we got a BIG treat. Rachel spotted a family of raccoons climbing a tree. We stopped to look at the mother’s masked face and get photos. Then we ducked into the woods and dense thickets of Siberian honeysuckle brush. We were happy for the shade. Once in the woods, Chris pointed out pink flagging in the distance. On the large map he had brought, he showed us on where we stood and how the trail location had been modified in two places to stay away from homes in Pine Ridge. Pine Ridge is the Fitchburg subdivision just beyond Dawley Park on the west side of Seminole Highway. Homeowners there felt the trail was too close to their property. They didn’t want to see bicyclists riding the trails. From our standpoint, it was clear that once the leaves are out, no way would they see anyone on the trails, particularly since they would be moved back from the boundaries. Chris also told us how impressed he was with the CORP group which is teaming up with Dane County Parks to lay out and construct the trails. “They are a very responsible bunch,” he said. CORP will not only help develop the park with their free labor and expertise, but they will also maintain and monitor it. Our experience with the bikers in Quarry Park fit with his asssessment. For these reasons, we were not too concerned when Chris added that in May, Dane County had already approved development of the Seminole mountain bike park. It was time to go home. I might mention that in the woods we also spotted raspberry bushes, a deer skull, bright orange mushrooms, bellwort wildflowers, and quite a few Jack-in-the-pulpit plants. Chris gave us his map to share with the neighborhood. 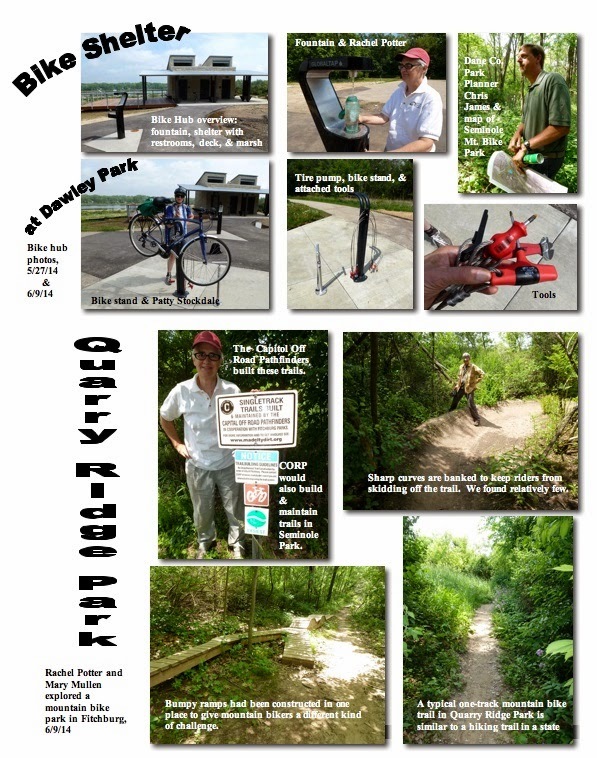 Tony Fernandez, the bike person at City of Madison Engineering, forwarded a “small clarification” regarding the article about the Cannonball Path in the June 1 DMN e-News. The clarification points out that the east end of the path that extends from the Beltline, near Culver’s, to Fish Hatchery Road is a Madison project that has a different completion date. This section is also along the Arboretum, but is a different part of the Arboretum than the part near our neighborhood. The Cannonball Path from Beltline to Fish Hatchery Road (Cannonball Path Phase 5) along the Arboretum is fully funded with City of Madison funds, easements have been obtained from the UW and from the Madison Recycling property and plans are final. Permits from the WDNR and U.S. Corps of Engineers are still pending but we hope to resolve that in time to begin construction in late-summer. The construction is complex enough that, unfortunately, it will not be completed until summer of 2015. The original article only pertained to the Fitchburg part of the project that is on both sides of Seminole Highway extending east to the corner where Arbor Hills begins and west all the way to PD/McKee Road where the bike overpass is in final stages of construction. The article about the Cannonball Path generated still further commentary. In my experience, drivers in Madison are becoming increasingly aware of and attentive at these crossings, and they work better for bikers and pedestrians than many people expect. It would probably be smart to run electrical at the time of the median build-out in case there's a desire to put in an actuated crossing at a later date. Tony, I would say that all three of the crossings you mention are very challenging to cross for peds and cyclists, especially at peak hours and all would benefit from enhanced visual supports for road users (better signage, additional paint, and probably user activated lights). The Fish Hatchery crossing will likely be as challenging as these others, if not more, due to high traffic volume, high speed, and the topography. Northbound traffic crests a hill just before this crossing and in my experience, road traffic is less inclined to yield at crosswalks when they're travelling downhill. You can see this at play where the SW crosses Glenway and Odana: westbound (uphill) traffic yields easily and quickly while eastbound (downhill) traffic is very reluctant to yield at all. Thanks for all your work in securing the easement along the rail line here. This will be a major asset to our path network once the connection is made to the Wingra Creek path. Editor’s Note: Where the Southwest Path/Badger State Trail crosses PD/McKee Road, bikers and pedestrians can push a button which activates a yellow caution light for motorists. This really catches their attention. Just a month and a half ago, the Marlborough Community Garden was a barren field. Now, neighborhood sight-seers who missed a few weeks will be shocked to see the amazing growth that has taken place since May 9. View the attachment for a picture story of how the seasons have brought a change from dormancy to raging growth. Do you know anyone who would like to take the last 2 plots? Both are already filled with tomatillo plants that reseed themselves. Contact Angelica at angeolvido@aol.com <mailto:angeolvido@aol.com> or 332-4832. When Sina Davis, a participant in The New Green Challenge, was growing up on the south side of Chicago in the Ida B. Wells housing project, it was about as urban as you could get with high-rise subsidized housing and the resulting crime and drug trade that came along with a high-density area of people with not a lot of financial means. It would be hard to make anything grow. But once the school year ended, Davis’ mother packed up the kids and headed south to Montgomery, Alabama, to the lush vegetation and humid summers of the South. It was like a paradise to Davis. And when it came to leave at the end of the summer, Davis’ family always left with more than they came from. Davis’ mom was an adherent to fresh, healthy food. And she made sure that there was plenty of it. Davis laughs when she says that she lives in a “food desert” in the Allied Drive area. She remembers those days down South and tries to bring some of that fresh food experience to Madison. While Davis has had her ups and downs gardening in the Allied Drive area, fond memories of the healthy food from down South have always made her try again and again. Here’s a fun way to get your ideas out in public for how the city of Madison should spend its money. Particpate in the website where everyone can share their thoughts with Mayor Soglin and the Common Council. For details on how to join the conversation, go to http://madison.ideascale.com/ <http://madison.ideascale.com/> Register, and then you can put out your own ideas and vote for or against what others have suggested. Shade trees make our streets walkable and cooler in summertime. With our ash trees being removed and replaced I think that the city should consider the eventual tree-crown size when they re-plant new trees. Many of the replacement trees being planted will never have a substantial crown to shade the road or sidewalk. They are the wrong species of trees for long-term shade. Under power-lines MG&E mandates that only short trees be planted. So on the opposite side of the road the city should make sure to plant large-crown trees that can shade as much as possible. This will ensure that our neighborhoods remain walkable and beautiful. Madison should update its "one-tree-per-house" rule now that MG&E controls which tree species get planted. Since only small tree varieties can be planted under powerlines, the city should plant more than one tree per household where they can. Under powerlines we used to get large Elm, Ash and Maple trees all of which gave substantial shade and cooling. Now we're getting crabapples, lilac trees and serviceberries (good trees, but tiny!) to appease MG&E. As a result half of our street-scape will be shadeless. Replacing one large-crown tree with one tiny variety is a mistake. Instead, planting two small-tree varieties in their place will maintain some beauty and shade in the long run, that one small tree could never do alone. Powerlines are ugly enough as they are; the more little trees under them the better. Ten people agreed with this. OK, it’s time for you to broadcast your own ideas and vote on those you see on that website. Fitchburg’s Hometown Pharmacy (3000 Cahill Main, Suite 114, near Copps) recently announced that they are able to accept unused and expired medications as long as they are not considered “controlled substances” per state and federal regulations. Fitchburg’s Hometown Pharmacy also collects Sharps (which include: Syringes, scalpels, lancets, and other sharp household medical waste). All Sharps must be properly packaged in either a red plastic Sharps container (available for sale at any of the local pharmacies) or a puncture-resistant plastic bottle (e.g. : used plastic laundry detergent bottle, etc.) labeled “Sharps” or “Biohazard”. Go local with the National Bike Challenge 2014! Sustain Dane is teaming up with the Wisconsin Bike Fed to organize a special Dane County competition within the 2014 Wisconsin and National Bike Challenges. shoot us a line letting us know that you want to participate in the Dane County Bike Challenge [See e-mail address below]. Your team will compete in a special pool against other Madison-area teams - with special prizes above and beyond the National and Wisconsin levels. The best part - you don't have to do any extra work logging or riding. And, it's 100% free! When you sign up for the local challenge, we'll track and tally your points on the National website against the other local participants. We'll send out regular (but not an annoying amount of) e-mails with leader board stats, tips and opportunities, and mini-competitions. East, West, North, or South, wherever you live around the Madison area, you can experience music outdoors throughout the summer. Besides Make Music Madison on June 21, 77 Square highlights 18 different events, many of them repeating on a weekly basis. The closest to our neighborhood are “Concerts at McKee” at McKee Farm Park, 2930 Chapel Valley Road, just off PD/McKee Road. Attend the monthly free concerts on July 8, and August 12. Youth performers start at 5:30, followed by featured acts at 6:30 pm. Of course, the biggest day of music will be Make Music Madison. with 380 performances at over 100 different outdoor venues all around Madison. In the Dunn’s Marsh neighborhood, two venues are listed: Allied Music at 2225 Allied Drive - in the back of Revival Ridge Apartments on the Alied Drive side - and Prairie UU Society, 2010 Whenona Drive, actually in the yard on Crawford Drive. One performance is listed at Allied Music, starting at 10:30 a.m. The Prairie venue, co-sponsored by Prairie UU Society and the Dunn’s Marsh Neighborhood Association, has booked 18 different performers/groups starting at 11:15 am and continuing until 8:15 pm. Whether you live in the city or the country . . . whether your home is large or small . . . whether you have a lot of time and money to invest in your yard or just a little, there is something you can do to improve water quality. The following suggestions are ways that you can make a contribution to clean water and a healthy environment. · Leave grass clippings on the lawn. · Keep fallen leaves out of the street or ditch, using them around the yard as practical. Properly place the remainder near the curb (not in the street) just before municipal collection. · Seed bare soil and cover it with a mulch as soon as possible to minimize erosion. Disturb no more ground than necessary for a project, while preserving existing vegetation. · Direct roof downspouts away from foundations and driveways to planting beds and lawns where the water can safely soak into the ground. Use a rain barrel where practical. · Use lawn and garden chemicals carefully and sparingly. Pesticides, including weed killers, should be considered a last resort – other controls come first. · Limit the use of toxic or hazardous products in general. Keep them away from storm sewers, lakes, and streams. · Collect oil and other automotive products preferably for recycling, or tightly seal and wrap them for proper disposal. · Wash cars on the lawn, where soapy water can’t quickly run toward the nearest storm sewer, picking up other pollutants as it goes. · Keep cars tuned up and in good operating condition. Check for drips and repair leaks immediately to keep nuisance oils off pavement. Better yet, walk, bike or take the bus. · For waterfront property, grow a “buffer strip” of dense, natural vegetation along the water’s edge to filter pollutants and stabilize the shoreline. · If using a septic tank system, maintain it properly through regular inspections and licensed pumping every two to three years. · Monitor fuel use from any underground gas and oil tanks to make sure they are not leaking. · Plan your landscape with environmental health in mind, reducing the area that is heavily maintained. · Clean up pet wastes, from which nutrients and bacteria could be washed toward lakes and streams. · Conservatively use salt in winter. Substitute sand or old-fashioned “chipping” when possible. In the past I’ve detailed the county’s efforts to partner with farm families, local governments, government entities like the Madison Metropolitan Sewerage District, and private community organizations to clean up our lakes. We’ve made great progress, preventing an estimated 4600 pounds of phosphorus – the main cause of smelly, unsightly algae that fouls our waters – from entering area lakes since 2008. Every pound of phosphorus we eliminate prevents 500 pounds of algae from forming – an impressive 2.3 million pounds of algae growth prevented by our work. To achieve cleaner lakes we must, and we will, do more. Starting this month, and in the months ahead, I’ll focus this column on the county’s different solutions to give you a comprehensive update on our efforts. In May, we announced an exciting new partnership with farm families to help reduce winter spreading of manure, a practice that can account for up to 50% of the total phosphorus load that enters our lakes between February and March each year. Farmers are good stewards of the land and have been a key ally in our work to clean up the lakes. Unfortunately, Dane County’s increasingly long, wet winters place a tremendous strain on the manure storing capacity of local farms. To prevent winter manure spreading, we will partner with our farmers to help create more manure storage space by providing interest-free loans and cost sharing funds. Farmers who participate will also agree to avoid spreading manure in the winter and at other less than ideal times, take other reasonable actions to avoid phosphorus runoff from their fields, and help the county evaluate the water quality impacts of our new program. Everyone will benefit from cleaner lakes, and farmers will benefit from the increased access to storage, which will let them spread manure when they really want to – when it’s best for the crops. Here's the second set of photos I took of Dunn's Marsh expedition, 6/3/14. ARTICLES - All short & related directly to the neighborhood. Contact info at end. Stolen: women's green hybrid Trek bike with serial number WTU2267798R. Had a wicker basket on the front when stolen along with a red & white helmet and bike gloves. Wicker basket has probably been removed. This bike was stolen Thursday, May 29 from a garage on Crescent Road while the owner was visiting with neighbors next door. Like home-baked goods? Then check on Britta Drive, on Saturday, June 7 to buy some between 3:00 and 6:00 pm. It’s a short street. You’ll see the sale in a front yard. Proceeds go to the Dunn’s Marsh Neighborhood Association. She’ll let you know where to bring them. This event is likely to be recurring, so if you can’t get to this one or donate, watch your e-mails. At this moment there is one garden plot available in the Marlborough Community Garden. However, some gardeners haven’t planted yet, and if they fail to do so in the next few days, more plots might come up for rent. If you are interested, e-mail marlboroughgarden@gmail.com Spanish-speakers may also contact Angelica at angeolvido@aol.com <mailto:angeolvido@aol.com> or at 332-4832. 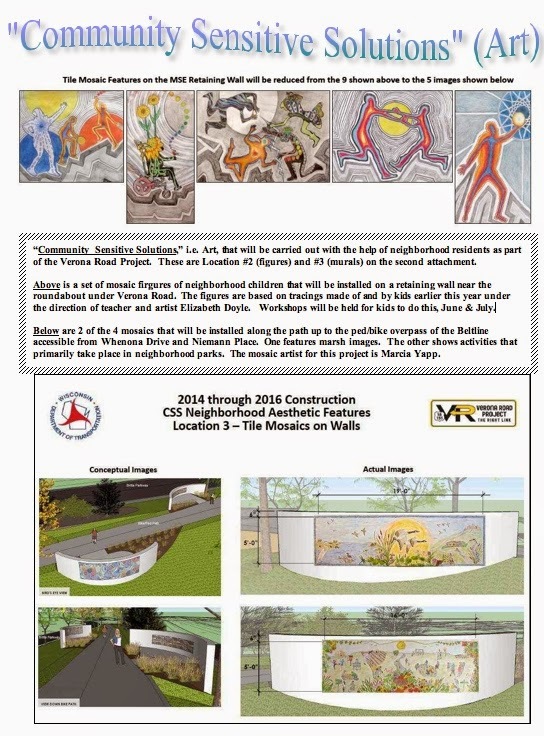 At its May 20 meeting, the Madison City Council approved the mosaic tile art grant for Marlborough Community Garden. The Dunn’s Marsh Neighborhood Association applied for the $918 grant, was supported by the other DMNA (Dudgeon-Monroe Neighborhood Association) which offered to serve as the fiscal agent, and gained the recommendation of the Madison Art Commission. City Council approval was the final step. Our Alder Maurice Cheeks also strongly supported the application. As a result, this summer Marlborough Park gardeners, including those from the Dane County Parent Council (Head Start) and the Madison School & Community Recreation Program (MSCR), will be creating 68 glass mosaic tiles for the community garden. About half of them will be used to label the 16 paths that traverse the gardens, making it easier for gardeners to find their plots at the beginning of the year and for monitors to check garden maintenance (weeds pulled). Another 26 tiles will spell out “Marlborough Community Garden.” These will be placed along the east edge of the tilled garden parallel to the bike path. The final 10 will be used to beautify the group gardens kept by the Dane County Parent Council and MSCR kids. Anyone from the neighborhood, whether connected to the community garden or not, may also participate in making the tiles. Christina Kantor, community artist, will lead several mosaic-making workshops. If you want to be involved in this project to learn how to make mosaics on foot-square cement tiles, keep tuned. Teacher and Mosaic Artist Elizabeth Doyle announced her final selections for the traced figures that will become mosaics on the walls near the roundabout being constructed under Verona Road. Eleven figures will be included in 5 panels. It’s finally Spring! I am sharing the designs I developed over the past few months in the attached document…. The document itself is created by the DOT showing the projects of all three Community Sensitive Solution artists. The designs will serve as a guide with allowance for some variation and more details through the tile setting process. 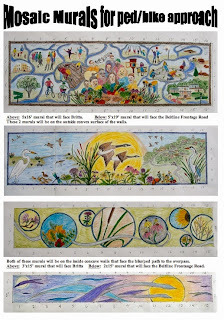 Kids in the neighborhood will be invited to participate in workshops to actually construct these mosaics. The workshops will be held in 2 different locations, Prairie UU Society and the Boys and Girls Club. The artist will schedule workshops, mid- to late June at Prairie UU. She will also be working as an artist in residence of sorts with the Boys and Girls Club on Tuesday and Thursday morning, 9 am-12 noon, June 24-July 24 where she will work with the B&G Club youth clubs. If you have children and you want to get direct e-mails about these workshops, please respond to this e-mail newsletter with your request and e-mail address. 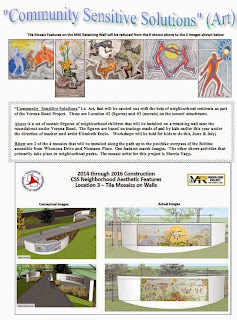 In an April 30 presentation, the Wisconsin Department of Transportation (WisDOT) presented plans for the 3 art projects - called “Community Sensitive Solutions” - that will be installed in the neighborhood as part of the Verona Road Project. One is a light box project that will be installed where Thurston, Allied, and the extension to Carling Drive will come together. A second one is a set of 5 panels bearing tracings of 11 neighbohood kids that will be turned into mosaics by neighborhood children. It will be located on a retaining wall on the approach to the roundabout under Verona Road. The teacher/artist directing this project is Elizabeth Doyle. The third is a set of 4 large mosaic panels developed by artist Marcia Yapp after consultations with the neighborhood. Two panels were shown in the presentation, one featuring marsh images, the other activites in the neighborhood. For a view of the map showing locations and images of the 3 projects, see the attachments. The section of the Cannonball Path that is located in Fitchburg currently is gravel. Fitchburg is planning to wait for the McKee Road/ Hwy PD overpass to be completed; then pave the whole trail from below the Arboretum all the way to the overpass on PD. The ETC (estimated time of completion) is this summer. Currently the Frontage Road Pedestrian/Bike Path begins at Seminole Hwy and ends to the east at the “Y” in the road. The monies used for that section came from the DOT project. When will the path be extended down to Todd Drive? The City of Madison has applied for a grant to extend the multi-use path in front of the Arboretum where it currently ends. There are several grade issues that make this section of path very expensive, $1,000,000+. Once the grant application is approved the City of Madison will place the project in the schedule. Any resident may attend the regular meeting of the Dunn’s Marsh Neighborhood Council. The Council meets the second Thursday of the month, 7 pm, Prairie UU Society, 2010 Whenona Drive.